With a combined total of more than 10 years of experience in operating power tools, the ProTool team spent 35+ hours on product-testing these contractor table saws, and further consulted industry experts as well. After some discussion, we reached the consensus that the DEWALT DWE7491RS is the best contractor table saw currently on the market. A table saw is the most efficient power tool for rip cuts, miter, bevel, and crosscuts. While there are tools for novices, a contractor table saw is always the ideal choice for workshop professionals. 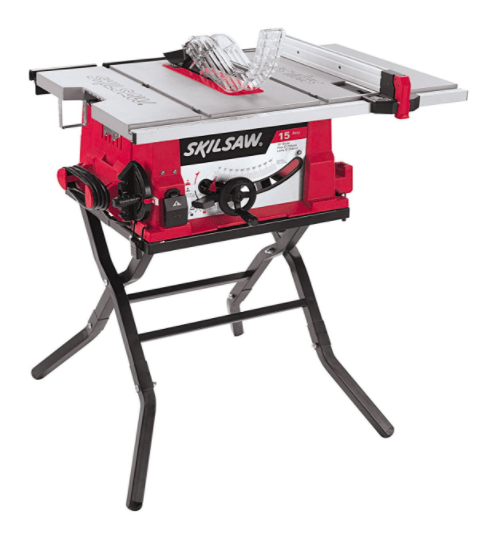 The best table saws provide a safe yet hassle-free experience for its users. With its smooth action and great safety features, this is a must-buy. A budget-friendly saw that is heavy-duty, yet compact and mobile. This professional-quality saw packs a punch and is dead-on accurate. Have certain specific needs for your table saw? 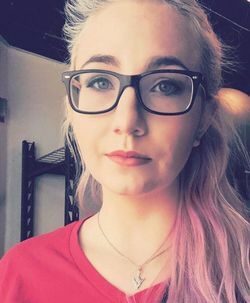 Want to branch out and try other brands? Got a limited budget and want to make the best of it? Check out our selection of shortlisted high-quality contractor table saws. Depth Of Cut At 45°: 2-1/4"
Depth Of Cut At 45°: 2-1/8"
Depth Of Cut At 45°: 2.5"
While a contractor table saw is definitely on the pricy side, the control, precision and power it affords you is well worth it. A good contractor table saw is a versatile tool perfect for many forms of remodelling and woodworking. By adhering to its Standard Operating Procedure, maitenance guidelines, and safety rules, you can make one saw last for many years. Nonetheless, finding a contractor table saw best suited to your needs can seem rather overwhelming, especially to novice woodworkers. After all, there's a whole bunch of complex-sounding specifications and features you may be perplexed by. Not to mention, contractor table saws often costs thousands, so you wouldn't want to make a costly mistake. But fret not- the contractor table saw reviews in this article are bound to help you with your choice. It briefly highlights some basic features of a few contractor table saws, and also includes expert buying tips, a how-to-use guide, and maintenance guidelines. This table saw is one of the most value-for-money contractor saws currently in the market. At 1/4 of the price of most contractor table saws, it still provides smooth, sturdy action, and a whole bevy of helpful features too. It has computer-balanced plates that help in the reduction of vibration, ensuring that you can easily make precise cuts for a better finish. It also has a 2-1/2-inch dust port, which easily connects to a vacuum for efficient dust collection. The amazing 32-1/2" rip capacity, aided by a powerful 15-amp motor, is sure to rip large sheets clean in half. In addition, the 10-inch tungsten carbide blade always maintains a true edge, staying sharp for long-term use. This table saw ideal for miter and slide miter saw jobs, and has a thin kerf for fast, smooth cuts. With a fully integrated storage system, highly portable rolling stand, and a relatively lightweight body that can still handle heavy-duty tasks, this saw is also highly mobile. Its rack and pinion fence makes fence adjustments very fast, smooth and accurate. This power tool has a 32-1/2-inch Rip capacity that allows for a powerful, smooth cut through loads of shelving and trimming materials. There's a learning curve to assembling and operating any table saw, but you'll get there in no time. The flip over Ripping Fence makes narrow Rip cuts a hassle-free task, while the 15 Amp motor rips through various types of hardwood with ease. This saw has a well-built, smooth-rolling stand that makes assembly and break-down very easy. The mobility of the stand increases the saw's portability, while its sturdiness ensures that your work turns out superb. Miter Gauge Is A Flimsier "Flat-Track"
This is one of the most versatile contractor table saws, and it comes with a special patented safety mechanism from SawStop itself. With the frequency of power tool accidents in mind, it makes sense not to skimp on safety. This saw's power and huge rip capacity makes it fit for handling larger materials and larger projects, such as building decks and dealing with lumber. Its 10-inch blade tilts to the left, and its dust port collection feature, which is located under the table, has a 4-inch diameter. A high-quality fence is fundamental to getting smooth action and precise cuts out of a table saw. This saw has a T-glide fence made of thick gauge steel, with an expansive work area and precise measurements, so it definitely measures up to that task. The fence also has a sure lockdown with zero deflections. Just familiarize yourself with its instruction manual and safety guidelines, and you've got an easy-to-use, easy-to-maintain table saw that has your safety as its top priority. It has a Sawstop safety system that guarantees your safety when you are working on it. Its blade has an electrical signal that changes when it encounters your skin, thus activating the safety system. Versatility is its strong suit, as you can easily upgrade it with two cast iron wings for a smooth fit and finish. These wings align very well with the table, extension table and rails, while the added weight increases its stability by reducing vibrations. Both of these factors ensure that you achieve cuts that are even more precise. Its mobility options enhance its movability. Easily move it around your shop or home, by including a contractor saw integrated mobile base or a contractor saw mobile cart. Do not underestimate push sticks-- they are a crucial part of table saw safety. Keep your hands at least a foot away from the table saw, making sure to use push sticks if you must get closer. With a 1.75 HP motor that clocks a top speed of 3,800 RPM, this single-phase contractor table saw definitely packs a punch. A cast iron table is the go-to for professional-quality table saws, as the material ensures greater durability and reduced vibrations. This saw does not disappoint in this respect, as it has a precision ground cast iron table and wings, which also have beveled edges for smoother miter gauge entry. This saw also features a micro-adjustable miter gauge with an extension plate, thus offering you better and wider crosscut support. The blade guard and riving knife have quick and easy release, for tool-less mounting and removal. The riving knife also maintains proximity with the blade to minimize any saw accidents. To top it off, it comes with storage hooks you can use to keep your working accessories within reasonable reach. With an absolutely impressive rip capacity of 50", it can easily rip through all sorts or sizes of materials. You know what they say- you pay for what you get. It has a dust port that ensures your work area is clean, making precise cuts considerably easier. Moreover, this feature removes any particulates within your surrounding air/face, ensuring a safer work environment. This table saw comes with a very useful and long warranty. It has a 5-year warranty on residential use, with 2-year coverage on commercial application. It comes with some very useful features, such as table extensions for large capacity cuts, an arbor wrench, two open-end wrenches, and four hex keys. Any chances of kickback are reduced by the riving knife, which maintains close blade proximity. This enhances your safety, and reduces blade-related accidents. This is one thrifty and portable contractor table saw, with loads of useful features. It has a coated finish for extended longevity, and a portable stand with heavy-duty wheels for easier movability. The spring-loaded system also adjusts and folds effortlessly for easy storage. It has a powerful 15.0 Amp motor that delivers 4,800 RPM, thus maximising your productivity, as well as an electric brake system for a smoother woodworking experience. Moreover, it has a tool-less, modular blade guard with an adjustable riving knife. In addition, it features two onboard independent stowable anti-kickbacks pawls and riving knife for through cuts. It has a one-year workmanship and material warranty and a 30-day return policy, in case you are not satisfied with its performance. At less than 1 thousand bucks, this is a thrifty saw with a rip capacity that still pushes above industry standard. Not only does it have decent rip capacity of 25-1/8", it can indeed rip the full 3-5/8" cutting depth it is specified to be capable of. Not only is this saw lightweight and compact for great portability, the stand lifts up and down easily, but is also stable when placed. The extendable wing gives you a larger work surface, meaning this small saw has a relatively huge work area. While the extendable area is not entirely level with the main table, it's within reason for projects by homeowners and novices. This is a highly portable table saw that you can work with anywhere. It is perfect for DIY projects, being useful both for ripping long boards into your preferred dimensions, and for crosscutting small pieces. It is also very powerful, and features a 3-1/2-inch cut height capacity that can easily slice through four times the material. You can achieve accurate settings and measurements using its EZ view measurement system and the self-aligning Rip Fence, respectively. Additionally, its cast aluminum table is of decent size-- measuring 20 by 26 inches, and capable of extending to 20 by 32 inches to accommodate longer work materials. At a miniscule fraction of the price of most table saws, this one's a steal. It comes with a heavy-duty steel folding stand that has a quick mount. This eases the set-up process, and allows for convenient storage, as well as easier movement within and out of the workshop. When it comes to performance, it has a 15 Amp motor that is great for ripping various types of woods. You can rely on this powerful tool to work on anything, hassle-free. This saw has 3-year limited warranty, which covers any defects in material and workmanship, for up to three years from the purchase date. You just have to register it within 30-days from the day of purchase. For the perfect rip, try using a featherboard. It adds as an extra 'hand', sturdily aligning your wood with the fence, and keeping it in place even during kickback. Pushing your wood through the saw can get much easier this way. Picking the best overall contractor table saw proved to be a contentious process. 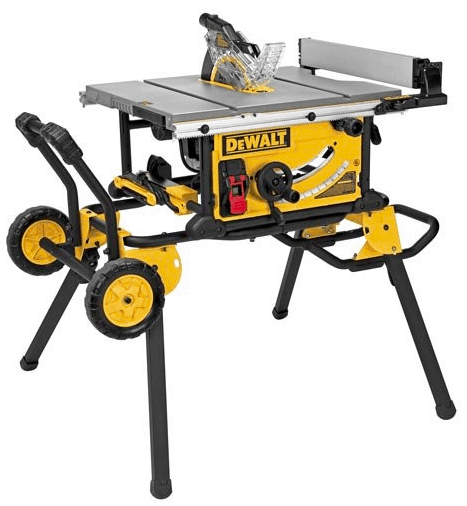 However, we eventually reached the conclusion that the DEWALT DWE7419RS is the most value-for-money contractor table saw. Its impressive rip capacity and large table makes it fit for projects of many sizes. Its durability features, such as a non-corrosive table and a tungsten carbide blade, means it's built to last. It's also got a whole spread of highly useful additional features too, for a safer, cleaner and breezier working environment. All in all, this is one handy saw that performs well above its price point. There are three types of stationary table saws, cabinet, contractor and hybrid table saws. They are usually a bit larger and heavier than portable table saws. Besides, they are more powerful and accurate when it comes to woodworking. However, they are a bit different individually, here is how. These are the best tables saw for professionals. They are a bit heavy, 200-300 pounds and have a powerful motor. Besides, their lightweight construction eases its portability. However, they can be hard to keep tuned, especially if they are moved around a lot. You can keep them in a workshop for optimal long performance. They do not take up much space. This type has a combination of contractor and cabinet table saw features. Moreover, they have the same power as contractor table saw and a partial cabinet with the motor, which helps with noise dampening and dust collection. They are small enough and lightweight for easier movability within the workshop and can be tuned accurately. These are usually large size and heavier, 400-600 pounds. This weight is ideal for the counteraction of the strong motor force as well as the minimization of its work vibration. Moreover, they are highly durable and have adequate power. Besides, they usually have three horsepower motor or more. Besides, they have a large table, durable cast irons, a heavy-duty fence and a full cabinet that contains the motor. DEWALT is a leading power and hand tool brand that specializes in different construction, woodworking and manufacturing tools. You can rely on its contractor table saws for quality work with a better finish. Besides, this brand has some of the most durable products with great ease of functionality. 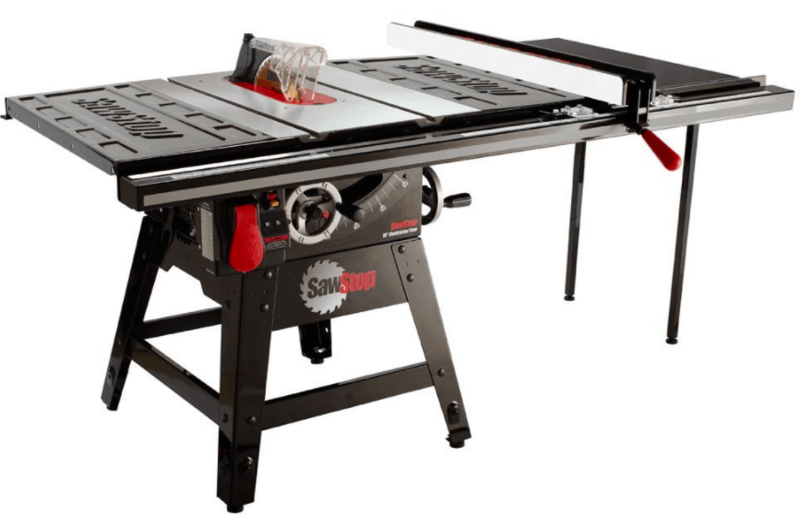 Sawstop is a leading manufacturer of table saws. Its table saws feature a patented auto-braking system, which stops the saw within milliseconds, just in case the blade encounters the operator′s hand or another body part. Therefore, you can rely on its contractor table saw for safety during cuts and rips. Powermatic tools are the most innovative woodworking tools due to their strict manufacturing standards. They have the best contractor table saw with superior construction. Makita is a world-renowned manufacturer of industrial power tool. Their products are energy efficient and compact with high industrial power. Its contractor table saw are the best as they offer precise and accurate cuts. Besides, they are versatile and can be of use on a job site or workshop. Buying a quality contractor table saw can be hard. However, with some buying tips and guidelines, you can easily choose the best one for your needs. Here are some few important tips, to get you started. 1. Power: Most contractor table saw have 15-amp motors with 1-2 HP and a wattage that ranges in between 750-1500W. Therefore, any power machine tool under this recommendation is weak and insufficient. However, depending on what you working on, never buy a motor with less than 750W but you can have one with higher watts, as this equals more power. 2. 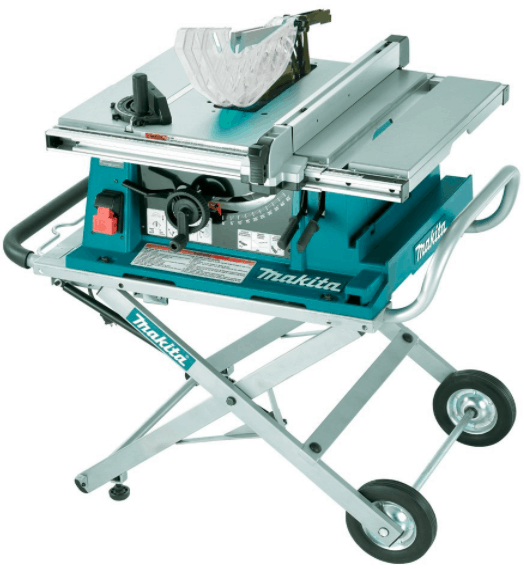 Stability: A stable contractor table saw base is necessary for precise and accurate cuts. Less stability usually translates to more vibrations and less accuracy. Moreover, it can also lead to some work hazards and is never safe. Therefore, ensure you get one with a strong solid base. 3. Safety Mechanism and Features: You should do some basic research on some of the essential safety features, needed in a table saw. Two most important safety features are anti-kickback mechanism and blade guards. So always, double check on these and others before making the purchase. 4. Work Surface: Always purchase a contractor table saw with a top-quality work surface. It should be sturdy, even and flat. You can estimate this with your hands or rely on customer reviews if you are buying it online. 5. Dust Collection: It is always important to have some efficient sawdust collection mechanism, even though you will be working in a workshop or outside. This saves time and ensures you have a clean surface to work on. 6. Extensions: Most of these power tools come with additional extensions. You can look for ones with a large surface. Professionals should always go for the upgradeable ones, those that can withstand additional features. However, it might cause you some extra coins. 7. Mobility options: As much as you are not supposed to move these power tools. If you are one to move around job sites, you can buy a lighter one or look for those that can adapt to wheels or cart bases, for easier movement. 8. 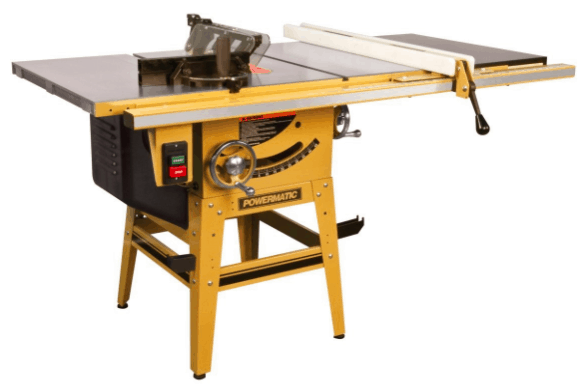 Price: As much as you have a budget in place, always opt for a quality and durable table saw as opposed to buying a cheap product that will not last. Some of the best contractor table saw do not come cheap but they are worth it in the end. 9. Warranty: If you are going to buy an expensive tool, ensure it has a long warranty coverage that touches on personal application and commercial use. Moreover, it is better to have a warranty with less fine print and exceptions. Table saws are the most versatile power equipment that you can use to make loads of wooden stuff. You can rip, bevel, miter and crosscut through the raw wood to something useful. Nonetheless, it is also dangerous, so you have to ensure safety first before proceeding to work. Moreover, you should always wear tight clothes and some protective gear, to stay safe in case of a kickback or any saw hazard. You can use a push stick to push the wood through to the blade and never let go of the wood until you are done or the blade is done with it. If you let go, it will simply fly over and hit your head. In relation, you should be in a position to locate your emergency turn OFF button. This makes it easier to turn OFF the contractor table saw quickly, in case of an accident. However, if you have no idea where to start due to the high number of features, you can always seek some help in a carpenter’s workshop. Never ever, put any food or drink on the tabletop, as it can spill and cause some damages to its parts. Always keep it rust-free, by using some sandpaper and woodblock, after which you can wipe the cleaned surface with a piece of dry cloth. You should note that climate also affects its functionality, so always check it for signs of corrosion. You should also wax your tabletop frequently this keeps it rust-free and smooth. Moreover, the waxing makes it easier for your material to glide and slide easily, minimizing any accidents. Before starting to work on it, you should check for any wear on its rear drive belt. Likewise, check for the blade teeth for any chips. In case, there is any wear and carbide on teeth, be ready to replace them ASAP, before they become a working hazard. Conclusively, buying a table saw is not easy but with this guide on the best contractor table saws review, you can easily make a pick that is right for your kind of woodwork. Feel free to share this informative piece with others, as it can be helpful.